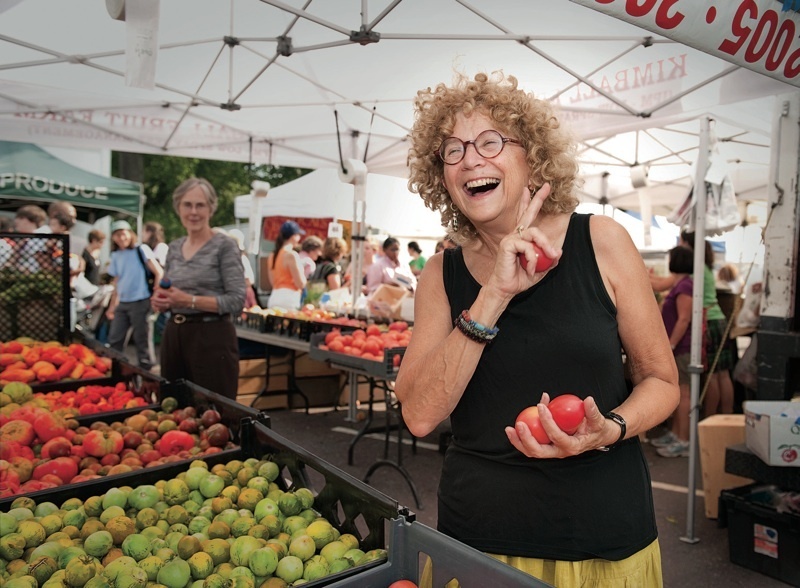 Corky White relies on her local farmers’ market in Somerville, Massachusetts, for the foods she cooks, pickles, and preserves. After their apple ice wine has fermented for three months, Margot and Leif Holtzman fill and seal each bottle by hand. Alex Lewin prepares his signature, locally sourced sauerkraut: high in nutrition, good for digestion, it encourages eating healthily even in the dead of winter. 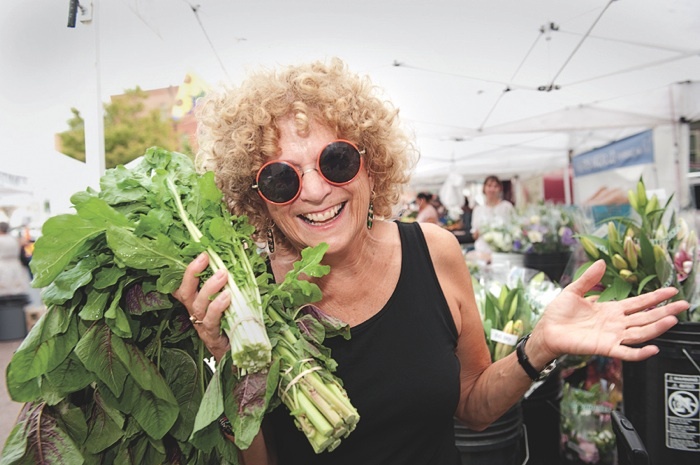 For many reasons, many people are joining the ranks of the local-food movement--those bent on consuming primarily what’s grown and produced regionally. 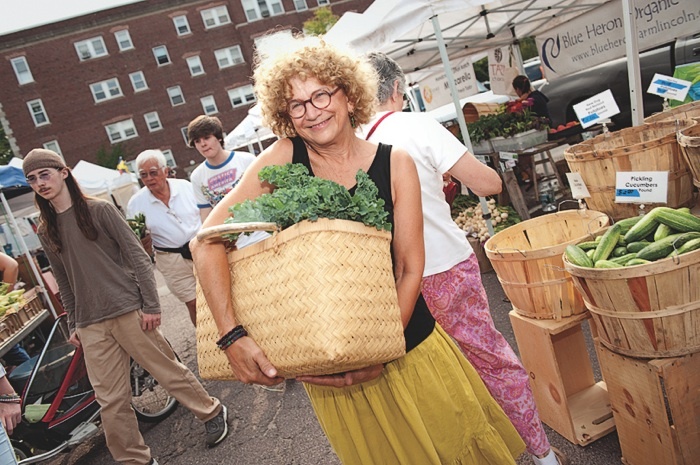 The number and breadth of goods sold at farmers’ markets around New England have grown wildly in recent years, as have Community Supported Agriculture (CSA) farms that supply fresh produce to members. The old-fashioned arts of pickling and fermentation, and other modes of non-refrigerated preservation, are also making a comeback as people seek more control over what they consume year-round. These profiles introduce a few of the many alumni cooking, eating, and promoting the foods growing closest to us. When she was “young, green, and crazily foolhardy,” Merry “Corky” White ’63, Ph.D. ’80, had a job cooking for the fellows of what was then the Center for West European Studies. “I was in way over my head,” admits White, now a Boston University anthropology professor. “But I was lucky to be cooking when we didn’t know much about ethnic foods. We didn’t even really know the word pasta.” Her strategy was to produce dishes even the well-traveled fellows might never have tasted--food from Afghanistan, Turkey, and all parts of Asia. White moved on to run her own catering business, which helped pay for graduate school in Japanese studies (she is still an associate of Harvard’s Reischauer Institute for Japanese studies), and write two cookbooks, Cooking for Crowds and Noodles Galore. But she lopped anything to do with food off her curriculum vitae, as she was advised to, when pursuing an academic career. Only after earning tenure in 1989 did she reinstate that material (“What can they do to me now? !”) in her professional biography--and began merging her interests as a scholar. In recent years, coffee and Japanese café society intrigued her enough to prompt a book on the topic due out in a year. “People think of Japan and tea,” she says, “but Japan is the third-largest importer of coffee in the world; they’ve been drinking it since the 1880s. They would refer to coffee as the ‘fuel of modernization.’” In fact, she adds, it was Japanese workers who went to Brazil in the late nineteenth century who helped establish that country’s coffee industry. “Want to try the sparkling version?” It is 10:30 in the morning as Wade Holtzman flips the lid on a bottle of carbonated apple ice wine he has carefully tended and fermented for three months in his family’s basement, now home to Still River Winery, in Harvard, Massachusetts. “Oh yes,” say his son, Leif ’05, and wife, Margot, Ed.M. ’72, happily holding up their empty glasses. Traditional ice wine uses grapes that have frozen on the vine, but the Holtzmans begin with unpasteurized apple juice fresh-pressed from the nearby Carlson Orchards, a 120-acre farm that grows 14 varieties of apples and has been in business since 1936. The liquid is frozen in containers, then allowed to drip-thaw for 24 hours. This process, repeated three times, separates out the watery residue and concentrates the apple juice to its richest state of sugar, acid, and flavor. A five-gallon jug of juice yields about one-and-a-half gallons of concentrated appleness, and the sugar content shifts from 9 percent to 32 percent before fermentation. Once yeast has been added, the concentrate is left to ferment for three months at 50 degrees until the wine is ready for bottling. Wade, who runs his own business as an antique furniture restorer from another part of the house, is the primary winemaker. Margot, a learning specialist at Cambridge Friends School, takes care of the administrative work; Leif, who studied psychology and economics at Harvard and has worked in online advertising, has overseen business strategy and marketing. Although he enrolled at Stanford Graduate School of Business this fall, he plans to remain an integral part of expanding the winery. The Holtzmans, for example, still fill and seal one bottle of ice wine at a time, using labels Leif designed. His parents fully expect him to fly home from Palo Alto for the annual marathon bottling session and hope he will cultivate relationships with California wineries for possible future partnerships. Leif laughs at this, but says he will do what he can. “It is a unique, gratifying experience to be able to hold something in your hand that you made and that people enjoy,” he says, looking around the basement, then at his parents. “And that we all enjoy ourselves.” Salud. Lewin is part of the collective “real food” movement, which incorporates locavores and proponents of slow food and organic/natural products. He buys primarily what’s in season locally at farms, dairies, or farmers’ markets, then cooks it or, even better, ferments, dries, salts, soaks, smokes, or pickles it. These “all add flavor, texture, and life, literally, to foods we otherwise take home in a can or a box,” he explains. What would be lost in giving up the variety and global exoticism we expect at the supermarket, he asserts, is found in improved ecological and ethical practices, personal health, and, for many, the surprising joy of creating something deliciously customized. Deeply impressed by fellow alumnus Andrew Weil’s Natural Health, Natural Medicine, Lewin graduated in 2006 from the Cambridge School of Culinary Arts, where he periodically teaches food-preservation classes. He is on the board of directors of the Boston Public Market Association and shares his nearly encyclopedic knowledge of food, with a focus on its science and politics, at http://feedmelikeyoumeanit.com. 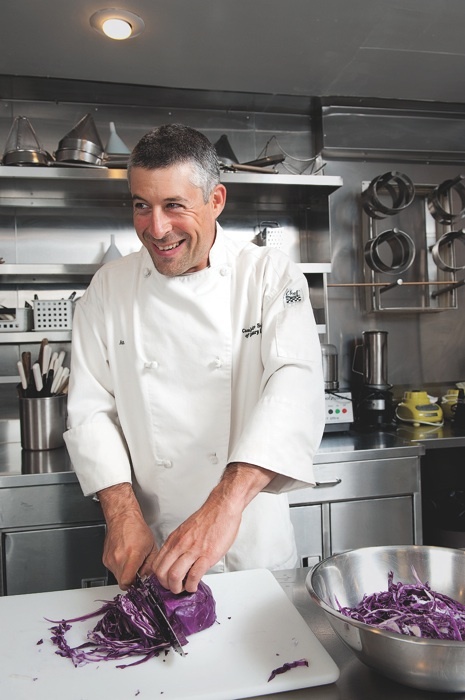 Lewin promotes fermentation of vegetables, which he carries out in his tiny Cambridge kitchen. (Fermentation, which involves a chemical change with effervescence, is different from pickling, which preserves food in vinegar.) People pay a lot of money for the same bacteria, “probiotics,” in capsule form, he points out, when they could ferment foods at home to help preserve vitamins and enzymes for better digestion, especially of proteins. “It’s not a coincidence that fermented foods are generally served with meats, which can benefit from the additional acid,” he adds: paté and cornichons, sausages and sauerkraut. With climate change, he believes, many agricultural skills that urban dwellers have lost--growing and preserving their own food, for example--are going to become essential to survival in the future.